Why Might Someone Want To Be a Caricature Artist? A caricature is a portrait that exaggerates and possibly distorts the essence of an object to create a likeness that’s easily identified by looking at it. The object could be living or non-living. 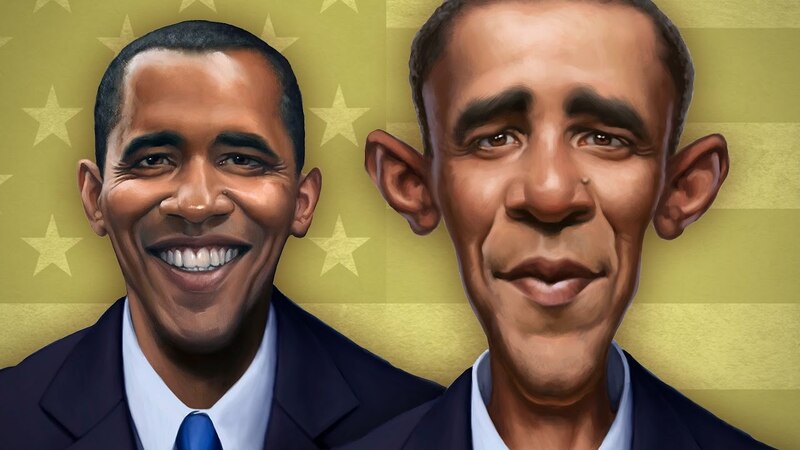 Caricature artists recreate objects by making use of an exaggeration of some characteristics. The finished objects could be insulting, complimentary or both and usually serves for entertainment or carry a political overtone. Editorial cartoons normally feature political caricatures while those of celebrities are plied in different entertainment mediums. The term caricature is coined from an Italian word which means to load or charge. In essence, it means a loaded portrait. There have been arguments that caricatures are only meant to represent the real-life objects and not fictional characters. The accepted conventional rule is that the characters loaded must either have inanimate objects such as coffee mugs or possess objective sets of physiognomic features to draw upon for reference. Famous caricature artists have often said it’s hard to draw a caricature of an animal that works as best as those of human characters. Caricatures date back to the olden days where artists look for deformed models to feature in their works. They endeavor to represent the original image in a way that is more striking than portraits. This whole art was born out of the need to load more meaning to an image. Caricature arts used to be distributed among closed groups just for the mutual enjoyment. Today, the art has gone public with many artists practicing their trade commercially in public places such as beaches, parks and other frequently visited tourist attraction center. It’s now a full-time employment opportunity and the art is also taught in colleges and universities as a subject. Why Become A Caricature Artist? Perhaps it’s born from having a warped sense of humor or more likely, it may come from a deep inborn resistance to rules and authority. Some artists do this work because they always hated staying within the lines and could not resist the urge to embellish or distort reality. Some people thought they will be recognized in public. They also surrendered to the practical realities of being able to eat regularly and having a roof over my head. Some can actually pinpoint the day with their creative ambitions which was dragged into the light of practical reality. People have been focusing their efforts on drawing caricatures. Nowadays, caricatures are no less an art form than they were in the past. Some artists are not actually considered artists because they create caricatures, but if it was good enough for people, then it is good enough for the artist. Or anyone else that matter. Caricature artists also offer great entertainment. Most of the guests will watch them at work and who could blame them? It’s interesting and very amusing to watch a caricature artist as they carefully command the pencil to draw larger than life representations of virtually anyone. Caricature artist tries to create an amusing image of the person for whom the caricature is intended for, by making use of the interpretation of words. They exaggerate, distort and inject some personal traits and will enjoy and laugh at. Because they believe if you cannot laugh at yourself and your own foolishness, you have no right to laugh at anybody else. At the same time, they make use of skills and techniques learned and honed over time to visually express their interpretation. The use of high inks or quality paints is very important, for vibrant and enduring color. Also, the use of high-quality paper is essential. Therefore, what the person gets, which is the one who receives the image is a real piece of art, worthy of much more than cartoons. It can never be compared to anything else because all pieces of original art are completely different from all others. It is unique, just like the intended recipient of the work. Caricatures are a distorted portrait of an object but need a reasonable resemblance. The subtle but very important skill in caricature art is being able to capture your subject’s personality and expressing it very well. A portrait artist attempts to recreate real life pictures, but a caricature artist focuses on exaggeration. Some over exaggerate facial features, but it’s only a matter of style. Begin with the eyes, the top eyelids first. Observe the size, shape and distance. Next, outline the nose and note the relationship between the nose and the eyes. If your subject has a large nose you can make use of thick lines. This is a good opportunity to exaggerate. The face is drawn in a top to bottom order. Next, draw the chin, cheeks, and jaw in that particular order. The chin provides another opportunity to exaggerate. Drawing the chin first also automatically suggest how the jaw line ends. Next, draw the ears and the hairline. At this point, the finished caricature will show if or not they have a big forehead. Roundup by drawing the hair and head. If they have hair, be kind, keep it in mind that the external perimeter of the head is an edge, so a thick line is needed. Next, draw in the bottom eyelid and add the eye bags if present, then eyeballs and return to finish the bridge of the nose. Draw the cheeks, you should know that some people have more cheek structure than others. The final step is to add the minor details such as scars, facial hair, freckles and your caricature is almost complete. Add finishing touches, and now you have successfully completed your caricature. Today caricature remains in celebrity magazines and political cartoons, but has also become an art form of the people as artists working on street corners producing caricature drawings for a small fee.